A flatslide carb upgrade at 30mm or 32mm seems to wonders for the CG250 Engine from Honda. TheCG250 engine is used in the Cleveland Cyclewerks Tha Heist, Misfit and Ace. There are also off road bikes and ATVs using the CG engines also.The stock carb is 30mm round slide. Flatslide will respond better and allow more air flow. When installing a flat slide carb will need intake manifold change also. This again opens up the intake for better air flow. Jet changes for pilot jet will much easier than stock. A new cable will also be needed when adding the larger carb and intake. 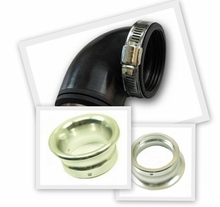 Use this air intake with Velocity Stack when upgrading to flatslide carb. The ID is 48mm for the elbow which fits fine on the carbs from OKO 30mm and 32mm plus Mikuni TM Series. These parts worked together to smooth out the idle giving much better flow at top end.